In honor of the puppy loving Paisley and her 3rd Birthday the new characters to the WINNIE THE POOH series are donated to the museum - Blue Collar WINNIE THE POOH, DARBY and her puppy.BUSTER. Since the little princess Paisley likes princesses so much the two latest additions to the DISNEY PRINCESS series is contributed to the Cornwall Collection - POCAHONTAS and MULAN as freestanding pieces. As winner (co-winner actually) of the Ward Halloween Party group theme costume we were awarded some fun character candy dispensers... that's right, the ever popular KLIKS. Woo.. woo! A new collectors set of LIGHTNING McQUEEN in all his different looks is just out. Look for them - they will go fast! Look for Star Trek The Original Series promoted to come out September/October. 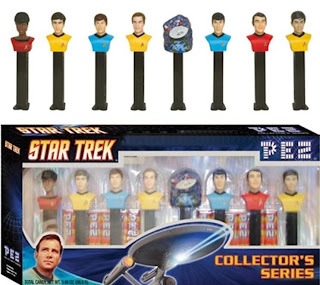 It's an eight dispensers gift set of the original crew - Kirk, Spock, McCoy, Scotty, Uhura, Sulu, and Chekov + The Star Ship Enterprise NCC-1701. The Enterprise will be unique for Pez as it depicts a ’scene’ (a Pez first), where you see the ship emerging from a nebula cloud The set will have a limited run of only 250,000. Word is they are slated for Walmart & Target stores - one forum mentioned it was found in Bed Bath & Beyond (use a discount coupon). 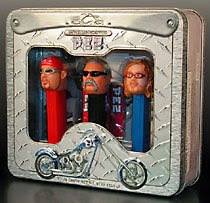 An unusual PEZ set came out a few years ago - ORANGE COUNTY CHOPPERS. Other than Betsy Ross, Daniel Boone and Paul Revere issued in 1976 as part of a bicentennial set, this is a rare issue of an actual person(s) and the first (and only to date) of a living person(s). Some may have wondered who these characters are and why they were "honored" by PEZ. Orange County Choppers Inc. is in upstate New York and featured on a regular T.V. show American Chopper which debuted in 1999 on the Discovery Channel. It is a reality T.V. program in which custom motorcycles are designed and built. The show has recently made it's way in rerun on local channels. You can go here to see a slide show of the PEZ theme bike which is on display at the PEZ U.S. factory. http://www.orangecountychoppers.com/occ/offairtheme.html - click on the "PEZ chopper". The Orange County Choppers Gift Set was "limited" to 250,000 or 300,000 and features the stars of the show: Paul Sr., Paul Jr., and Mikey. This set is part of the Cornwall Collection as shown toward the end of the video "How It All Began". 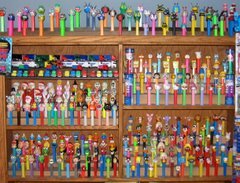 With PEZ dropping the "no real persons" rule, OCC opened the doors for any number of "real life" dispensers--rock stars (ELVIS), actors, politicians, etc... Many feel OCC will always be one of the oddest sets ever issued by PEZ. But hey, that's one way to get a $100,000 motorcycle in your front lobby.